The last quarter-final of the David Crichton Cup was played with Ashington Town Mortimer losing 3-5 to East Chevington. In a very competitive encounter, there were no goals in in the first half, although East Chevington did most of the pressing. The game came to life in the second half. East Chevington took the lead twice and were pegged back by the Mortimer. Chevington then went two clear, Mortimer scored again, but Chevington scored the last goal. They now meet Amble Tavern in the second semi-final to see who plays Bedlington in the Blyth final. Goals for the Mortimer came from Lee Messenger,two, and Louis Carr. East Chevington had a star performance from Andrew Bell who scored four. Josh Baston completed the scoring. Blyth Town went down at home in the first semi-final 6-2 against Bedlington Social Club Utd. 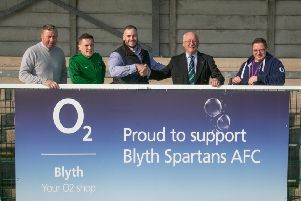 Sam Watts scored both goals for Blyth Town. On target for the Bedlington side were Andrew McLennen with two, Chris Phillips, Josh Monaghan, Michael Angus and Josh Beswick.